Pupillary Distance is the distance from the center of the pupil (black circle) in one eye to the center of the pupil in the other eye. This measurement is used to accurately center the lenses in the frame that you have selected. Place ruler (in mm) on the bridge of your nose. You can also get this information from your doctor or from a licensed optician. A good prescription should always have PD written in the first place. 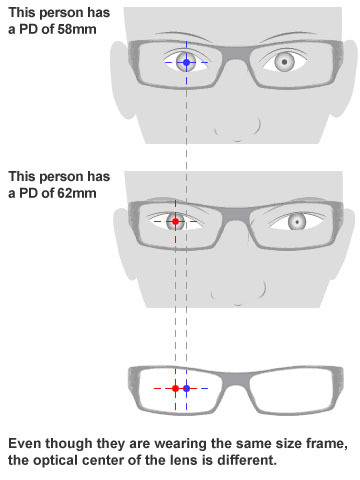 Typical adult's Pupillary Distance measurements (PDs) are from 54 to 66. Typical children's Pupillary Distance measurements (PDs) are from 41 to 55. What if my P.D. is written 66/63? The first number is the P.D. number we require to make your lenses. The second number (63) is the near pupil distance. This number is only needed when reading glasses are required.